Ok so the suspense is over. Having talked about what Fiori Elements are, how to design a list report, and having confirmed that a List Report is what you want, we move on to actually creating our first List Report… which will look just like the one above. Tip: You can find this and previous blogs on Fiori Elements on the Fiori Elements wiki. What we won’t do in this blog is look in detail at the underlying annotations (remember these are like formal comments) in detail. We’ll do that in the next blog of this series as we look at an alternative way of working with Fiori Elements using something called a local annotations file. Tip: You’ll need to know the alternate approach particularly if your OData service comes from an ABAP system lower than NetWeaver 7.4 SP05 or from a non-SAP system. Of course like all Fiori app frameworks there are extension options we can use to take our list report that little bit further…but that’s getting ahead of ourselves, so let’s come back to basics. Note that the easiest way to create the Fiori App is by using the SAP HCP Web IDE (or Personal Web IDE) and the List Report (formerly Smart Template) Application wizard. However it is possible to create your UI application manually in any text editor once you know what’s required. We’ll look at each of these steps in turn but let’s start by confirming the pre-requisites for Fiori Elements generally. A web browser that can run a Fiori app, e.g. Microsoft Internet Explorer 11, Google Chrome, Firefox, etc. A frontend server that provides a SAPUI5 version capable of supporting the Fiori Elements (formerly known as Smart Templates) we want to use. If you are running an On-Premise Gateway system that means you need NetWeaver 7.50 SP1 or above. Naturally the higher the release, the more Fiori Elements and Fiori Elements features available. An OData Service to provide the data for the Fiori Element, e.g. to provide the data for the List Report. Note also that currently Fiori Elements support OData version 2.0 using vocabulary-based annotations. Annotations are a standard but optional part of the OData paradigm. One thing to notice right away is that the backend system or database which holds our data is not a limitation. We don’t need our backend system to be on a specific ABAP release or even S/4HANA, and we don’t need our data to be on a HANA database. That said, if we are using a backend ABAP system of NetWeaver 7.4 SP05 or above or a S/4HANA system, the backend system provides some features that make it easier to create both the annotations and the OData Service. That makes building our List Report easier, which is why our first use case uses a S/4HANA system for the example. Similarly a HANA database is not necessary, but if we have a HANA database underlying our backend system the performance is improved, especially when we want to include analytics or do keyword text searches. First and foremost we prepare the OData service that will extract data from our backend system to be displayed in our List Report app. And of course as it’s a list, the usual paging features such as $top, $skip, etc. Tip: When designing the OData service it’s worth considering what features we want to support in our List Report. Is it just a read-only list or should we include some CRUD (Create, Read, Update, Delete) features? Do we want to support Draft document handling? If so the OData service needs to support these. Tip: ABAP Development Tools for Eclipse are needed to do this. If you have never used CDS views before, then now’s the time to learn it! CDS views underly all the latest Fiori frameworks. You can also find more on this topic in the SAPUI5 SDK > Developing apps with Fiori Elements (Smart Templates) > Preparing OData Services. The example we are using was prepared for the Teched 2016 workshop DEV268 Building an End-to-End SAP Fiori App Based on SAP S/4HANA and ABAP. I was privileged to assist some of the team with the workshop – Jens Weiler, Ingo Braeuninger, and Chris Swanepoel – at the Las Vegas session. Given we have created a CDS View to specifically support our List Report, we can add the annotations directly to the CDS View, that will look something like this… I’ve highlighted where the annotations are applied. Whether placing the annotations directly into the CDS view definition is a good idea from an architecting standpoint as you scale UX is debatable. Mixing the annotations directly in with the CDS view raises some Separation of Concerns issues, and it can be rather annoying if we later want to reuse the same CDS View for a different Fiori Elements app. We’ll talk more about annotations in the next blog. So finally we are ready to create our app based on Fiori Elements. The simplest way to do this is to generate the app using the List Report Application wizard in the SAP HCP Web IDE. As usual, we use the menu option File > New > Project from Template to access the app generation wizards. On the Template Selection tab, we select the List Report Application (previously Smart Template Application) wizard. On the Basic Information tab, we enter the Basic Information of our app – Project Name and Title. We can add a namespace as well if you wish. On the Data Connection tab, we select our OData service as usual. On the Template Customization tab, we select the OData Collection (i.e. entity set) on which we want the list report to be based. If there are associated navigations then these can optionally be selected also. Tip: These associated navigations are useful for displaying additional information when navigating from the List Report to the related Object Page and to subsequent Object Pages. We’ll get to the Object Page in a future blog. Press Finish and our app is generated. Provided our OData Service contains all the annotations needed to create a basic List Report … we can run our fully functioning app straight away! Filters, grouping, sorting, multi-item selection, button and link navigation, and even the totals bar are all working immediately. We can even go further than that and add rating starts, progress bars, and charts… and we’ll get to those in a future blog. So how does a Fiori Element app work? We can see some clues by taking a look at the structure of our generated app. 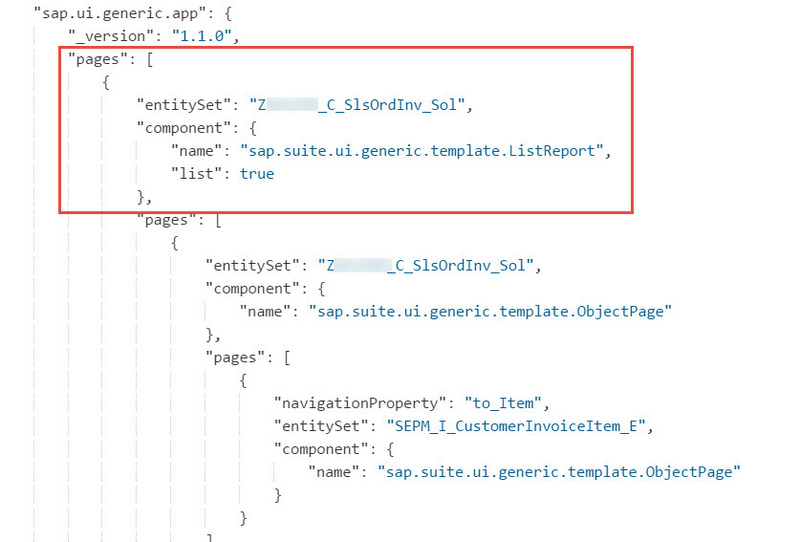 If you’ve created some custom apps before or implemented some SAP delivered Fiori apps, you’ll notice the app is structured a little differently from the SAPUI5 apps you are used to. There are no view, controller, or model folders and files. That’s because these will all be handled by the Fiori Element templates themselves. Instead of view, control, and model folders and files, we see an annotations folder and annotation.xml file. 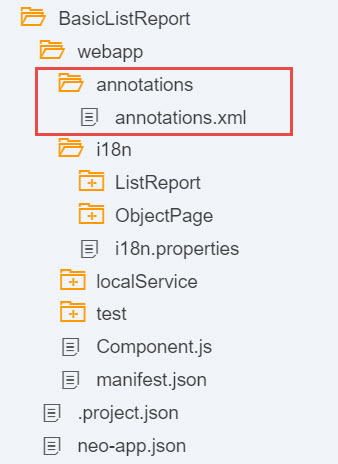 This annotation.xml file is the local annotations file which we will look at more closely in the next blog. There are also several i18n property files. Taking a close look also at the manifest.json file…. We see the annotations files have been added as “data sources”. As usual the i18n properties files are listed as “models”. The real magic of a Fiori Element app is in the “sap.ui.generic.app” section (which you will find after the “sap.ui5” section). This is where the List Report and Object Page dynamic templates are applied to our app. At runtime, the app applies these dynamic templates to the annotations in our project (including the ones we inherited from our OData Service) to generate a working, high quality, production-ready, SAPUI5 app. Where do we find a list of all the annotations? How does the List Report user interface map to the annotations? What features does the List Report provide and how can they be controlled by annotations? And that’s what we’ll start to look at in the next blog as we delve into the local annotations file. Really nice blog, have done the same in hands-on sessions at TechEd Barcelona last week. As a follow-up question regarding system landscape: could I actually do this on the NetWeaver AS ABAP Developer Edition offered at https://tools.eu1.hana.ondemand.com/#abap, connected to my HCP trial account via local Cloud Connector? yes this is possible – feedback how it worked for you is also highly appreciated. If we need to provide a range of values in the filter then what should we do, for example we need multiple company codes in filter criteria or a date range to be entered as input, in this case what should we do, Please advice. The list report uses a fully functioning Smart Filter bar. Ranges work in the filter criteria as do date ranges for input in date fields…. with the usual provisos about checking for SAP Notes first as there were some early issues with dates in the filter bar. So once you click into the filter field you can create all sorts of conditions. There’s an example of the Smart Filter Bar in the SAPUI5 Explored library. The Fiscal Year filter shows you the default behaviour of filter fields. Thanks for the clarification jocelyn. but for the normal case in a CDS the range input parameter is still not supported(with parameters option), please correct me if i am wrong. Perhaps we are talking about different things IK? You can certainly enter a range in a filter parameter in the Smart Filter Bar of a Fiori Element List Report e.g. Company code between 1000 and 1100. However your response sounds like you may be talking about parameters directly in the CDS definition itself. Please note that the CDS definition itself is not the focus of this blog. If you need confirmation of CDS functionality that would be best handled as an ABAP question perhaps. With more Fiori elements on their way (i.e. no more SAPUI5 development for most of the use cases), what role UX developers will play? Don’t worry! There’s no intention to replace UX developers by covering all use cases with Fiori Elements. We just want to cover the most common repeatable pattern – the stuff that should be pretty boring to a developer. For a good UX developer there’s always a use case – especially for tasks tailored to the mental model of a specific user group or business role. Also, I am looking forward to more blog posts and information on using Fiori Elements. There does not seem to be much documentation on the subject as of yet. We started to build an app using Elements, then ran into some roadblocks and restarted from scratch. Namely, we could not figure out how to navigate to other custom pages that weren’t using the builtin ObjectPage and ListReport templates. As an example, we wanted to link to a page which we could control the view to switch between an add/edit function. Either we did not set something up properly, or there just isn’t enough documentation or examples on how to do this. Because there is no routing and targets in the Elements app, we were not able to wrap our heads around how to get that part working. Time also became an issue, as it ended up being quicker for us to just create an app from scratch then spend a bunch more time digging through documentation, blog posts and Q/A to figure out what we wanted to do. Is there any way to download these sample apps so we can see how all of this is done? These sample apps look very well put together, and would be useful to have as an example when creating a new Elements app. Thank you everyone for all the information on the blog. In response to your response, did you find a way to download it from sample applications? Really like it, it helps a lot to clarify what the list report really is as the concept is actually not clearly described in the “Official Online Help”. Looking forward to your further blogs on this series. Really nice blog. You have written it in a way that made it really easy to understand for me. I tried it out myself and it works well. I have followed your blog and created a simple sales order CDS model. I have created three CDS views. I have navigation defined to and fro between SO <-> BP and SO <-> SI. I used the List report template as illustrated by you. It works fine. But I created a second project using List report template and this time in the ‘Template Customizing’ screen, instead of choosing ‘Sales Order’ entity set I choose ‘Business Partner’ entity set. I wanted to start the app with BP List and then navigate to the associated Sales order from there. This time the application ended up in error when I hit the search button on the List view initial screen. I get the following error in my browser debugger console. Question: Does this mean List Report template only work when data binding is done with the OData Entity Set corresponding to the CDS Root View(SO in my example)? Ok based on your error message that isn’t the problem you are experiencing. I take it you applied Draft Handling as per the ABAP Programming Model for Fiori – well done! Once you apply Draft Handling the IsActivityEntity parameter is a mandatory parameter of the OData Service – so you have to provide it always. I am using same example for CDS-BOPF, but our UI/UX is not UI5/FIORI but its different, so I thought instead of using annotation Odata:publish: true I opt for data reference as cds. Please guide on on this issue. I got the solution for this. IsActiveEntity=true in URL and it start working. Really nice blog, it helped me a lot . or as stand alone app ? You deploy your app to your runtime environment – whether that’s an on-premise ABAP Gateway server or a Cloud Portal or Fiori Cloud edition or some other server – just like any other custom built Fiori app. That’s a standard feature of the Web IDE – the help is here. 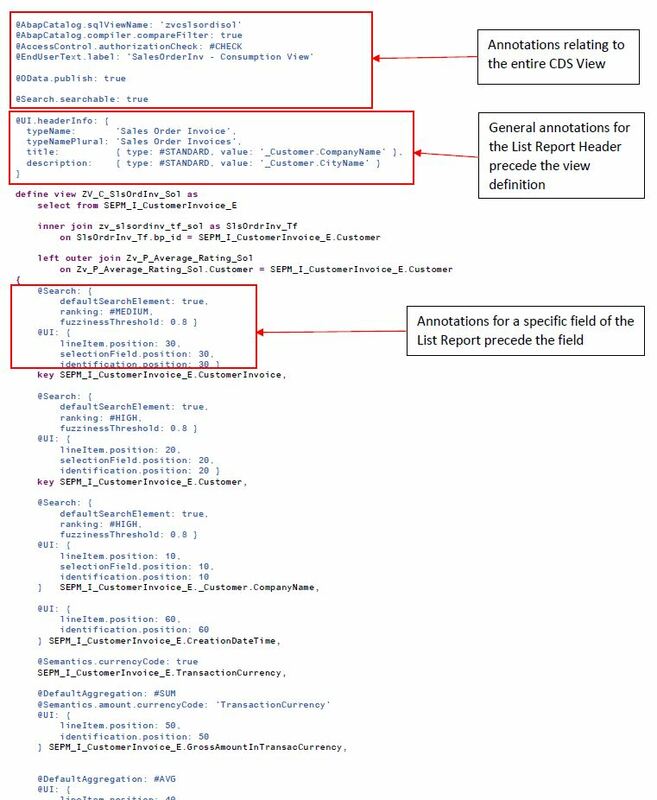 Could you please help me understand if the future model for fiori apps in s/4 is going to be based on SADL with ABAP CDS annotations, BOPF and OData ? So is it going to be completely template driven. Also the youtube videos on ABAP programming model for s/4 isn’t helpful to me. Can we have short tutorials and most importantly good easy to understand documentation on CDS annotations. The ABAP Programming Model for Fiori is the recommended approach when developing Fiori apps on NetWeaver ABAP servers. However there is some flexibility and alternatives within it. For instance, we don’t ever expect that it will be *completely* template driven – more that we try to cover as many common use cases as we can with templates. This minimizes when you need to do full freestyle development – although of course you can develop the underlying OData Service in the same way even for freestyle apps. Really nice blog, its useful for me . But i have a doubt do i need to write OPA integration test and qunit test ? If yes how should i write this test code ? Very nice blog, but i have a question. I’ve create ListReport using CDS + annotations+ SEGW. And now i need to add my own selection field on listReport without reference to CDS field.Can I do this with local annotation or abap code in *_MPC_EXT class? How to populate PARAMETERS on a CDS view? I have a TABLE FUNCTION which requires parameters, and I can’t figure out how to make that work. Code commented that did not work, so I hardcoded for Question 2. How are you populating _item. The code above with hardcoded parameters to Table Function works, but the navigation to _item brings up an empty table. FYI… the parameters, and navigation work fine in Eclipse. Argh. I can’t figure out how to make work cds table function in ListReport too. Maybe Jocelyn can help us ? Hi folks, CDS Views with Parameters are not currently supported by Fiori elements. CDS Views with parameters are mainly used with analytical apps such as Smart Business tiles. If you have further question please make sure you raise them as question on answers.sap.com. Blog comments are not the proper place to resolve specific issues. When I run a List Report App works on SAP Web IDE but when using the SAP Web IDE Full-Stack and I run the app is blank nothing is showed. There are some settings that has to be done when using SAP Web IDE Full Stack ? Hi Rodrigo, No there isn’t anything extra – they should work the same. Just make sure you are starting your test by running it from the Component.js file. Yeah, was a general problem that occurred with all testing in SAP Web IDE Full Stack Trials accounts. And CNA205 What’s new in Fiori elements… a WYSYWIG editor coming at last !! !